I believe I’ve gone on record as saying that Phillips has a penchant for making very strange limited releases. Beers that have interesting names, concepts and inspiration behind them, yes? Yes I think I say that just about every time they make a new release. And their special 11th anniversary release was no exception. 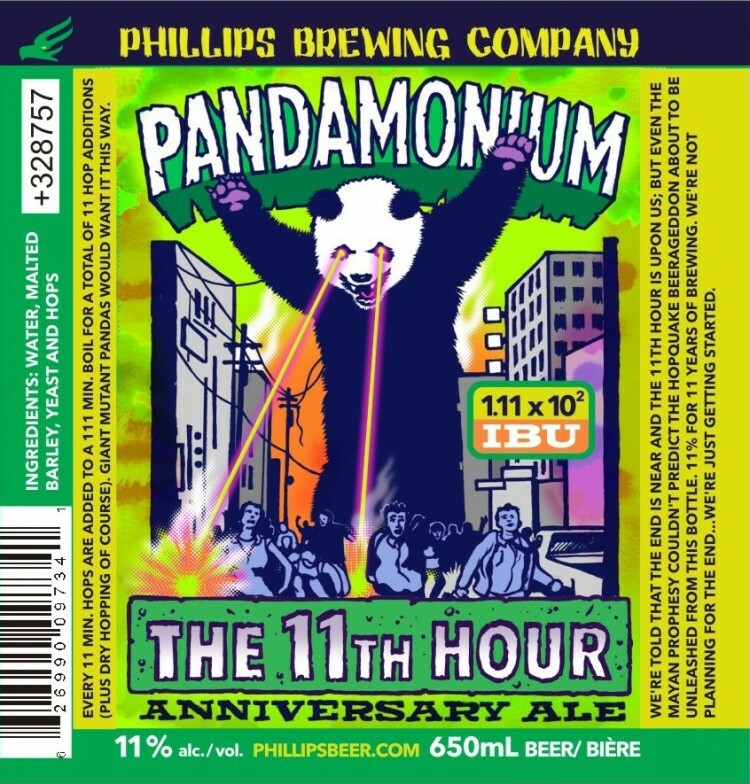 For their 10th anniversary, Phillips chose to release a 10% Double IPA to mark the occasion. And in keeping with that tradition, an their 11th is being marked by an 11% extra strong India Pale Ale. And it would be no exaggeration to say that it is a rather interesting signature creation! What sets this ale apart, aside from the sheer strength of its malts, is the amount and variety of hops they added. This began with hops being added pre-boil, and then added every 11 minutes over a 111 minute boil period for a grand total of 11 hop additions, plus a dry hop when it was all over. That’s twelve different infusions of hops, and this certainly comes through in the taste! Its finally here! After months of teasers, guessing, and even an online poll (conducted by yours truly! ), Hoyne’s Fall surprise is finally here. And wouldn’t you know it, they’ve chosen to go with a pale ale. And not just any pale ale, mind you. Apparently, this ale is of the “wet-hopped” variety, a process whereby the hops used are not dried beforehand. What’s more, the varieties used are locally sourced from Sartori farms BC in fact, and include the ever popular Cascade and Centennial varieties. The result is a floral and herbal pale ale with a mild citrus kick and a very smooth flavor. 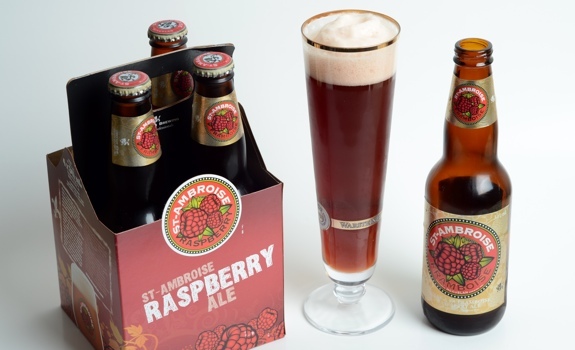 And above all, it’s very drinkable, goes down easy, but still delivers a very appetizing, well-rounded flavor. Overall, the wife and I were very impressed. Which is good, considered we waited some uncomfortable months for it’s release! Once again, Hoyne, you’ve hit it out of the park. You better have this one in growlers soon because I want to secure as much as I can before you cease production on this one! 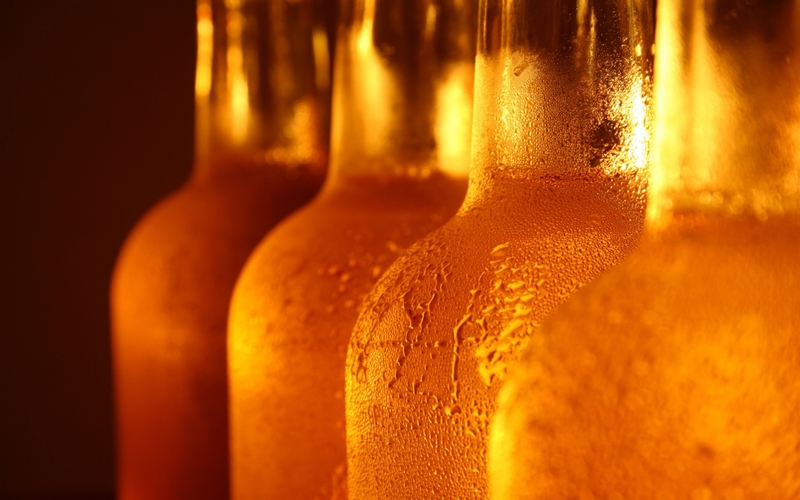 Fall’s here, and you know what that means… Pumpkin Ale! 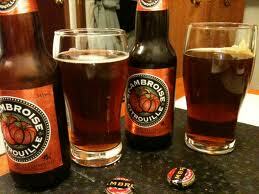 And much to my delight, St. Ambroise has once again released its seasonal, otherwise known as St. Ambroise Citrouille. For some time, I’ve been looking to get my hands on this one again so I could give it a more thorough review. And when it comes to pumpkin ales, there are few as deserving as this one! As I’ve said before, pumpkin ales are becoming all the rage when it comes to craft brewing. 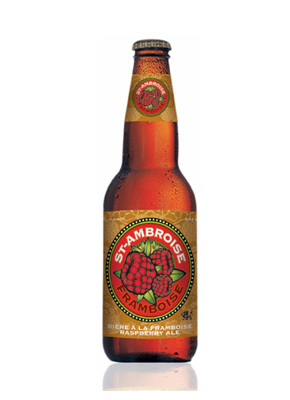 Every year, more and more microbreweries seem to be producing their own variant of the pumpkin, and I was quite thrilled when St. Ambroise produced their own. More than most, they have captured the essence and appeal of this seasonal ale, which is basically pumpkin pie in a glass! As promised, a review of yet another Phillips limited release. 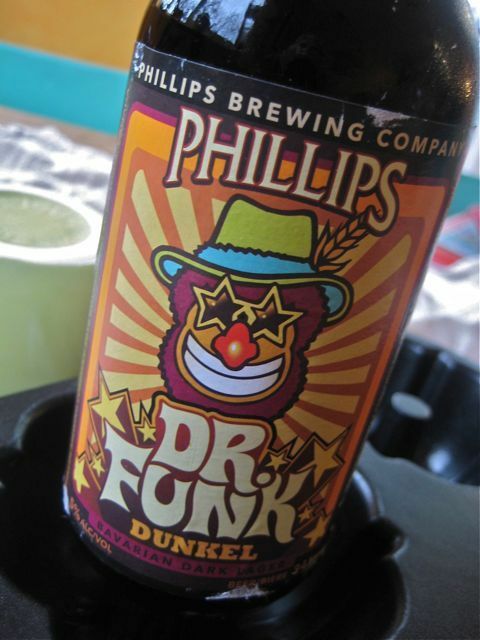 Today, it’s Dr. Funk Dunkel, the funky dark Bavarian-style lager that is a testament to both Phillips long standing reputation for good beer and odd names! According to Phillips website, this beer is being released yet again, so my (un)timely review hardly seems so important anymore! But then again, who wants to read about a beer that is no longer even available? So naturally, I’ll be looking for it again, and I recommend others do the same. Recurring or not, it’s not a permanent part of Phillips lineup… yet. Dunkel is fast becoming one of my favorite styles of beer. Something about a dark lager just pleases me, possibly because it reminds me of the tall mugs of beer the wife and I tilted while we were in Germany. Little wonder then why I enjoy pouring several cold bottles of this beer into my stein and saying Prost! Welcome back, Funk! Welcome back! Tonight, while I’m on the subject, I’d like to review my second purchase from the Spinnakers Liquor store! Seeing as how I don’t do much liquor shopping down at the waterfront, I was sure to pick up the things that I wasn’t like to find locally. With that in mind, my second selection was a six pack of Steamworks Pale Ale. Having been to the base of operations many times, I can attest to the quality of their product. 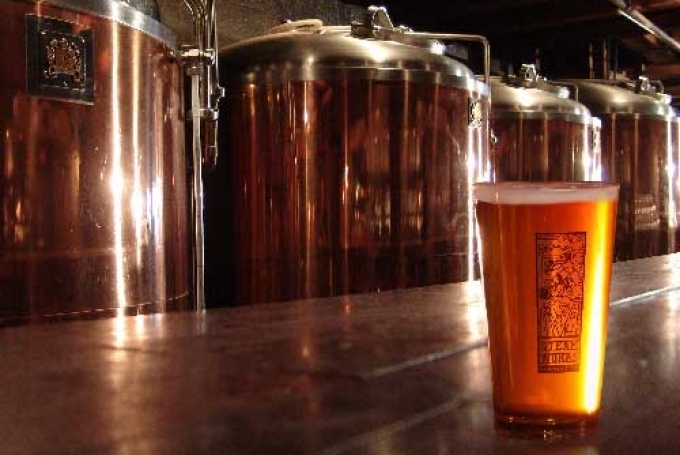 Located in Gastown, in the heart of Vancouver overlooking Coal Harbor, this brewpub has been in operation since 1995. However, my own experience with it goes back to 2006, when I first moved to the West Coast and began looking for a watering hole when visiting the mainland. One visit coincided with the 2010 Winter Olympics. Man, was it packed! In any case, here’s what I had to say about their “Signature” product. Overall, I was somewhat surprised by this product. On the one hand, it had a malt characteristic that was consistent with a Northwest Pale Ale and a hop bite that is in tune with Cascade and Zythos (a special IPA variety) hops. However, I was surprised to note how mild the hop aroma is. With a nose like that,coupled with it’s mild color, one would expect it to not have much flavor. And yet, flavor is where it delivers the most. Interesting combo, worthy ale, worth trying!